Authentic Geek! 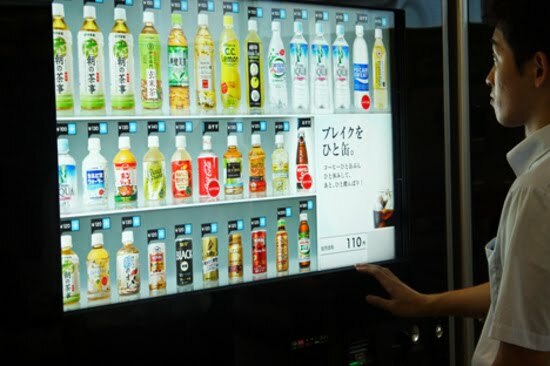 : Hi Tech Vending Machine With A Touch Screen or "You Can Look AND Touch"
Hi Tech Vending Machine With A Touch Screen or "You Can Look AND Touch"
The Japanese are known for a lot of things. Genre bending anime and manga. Creepy and truly scary 'horror' movies. And stunning technological innovations, like a new vending machine with a touch-screen selector called the aCure. Currently set up in Shinagawa Station, one of the busiest train stations in Japan, and serving some tasty cold beverages, the aCure is already drawing a huge following. Hmmm, a flashy touch-screen computer thingy that serves cold drinks? I only know about ....oh, I don't know .... a few hundred geeks, nerds and assorted technophiles that would love to get their Cheetos dust covered hands on this, if only to 'jailbreak' it and incorporate this into their fridge.